IF IT ever seems windy where you live, be thankful you do not live 10km up in the air. At that height, the jet-stream winds blow stronger and more constantly than ground level winds, carrying up to a hundred times more energy. So, just as oil companies are drilling deeper and in more remote locations in search of new reserves, pioneer wind-power engineers are looking higher in the sky for new sources of energy. Conventional turbines will not take them there—the highest to date is just over 200 metres tall. 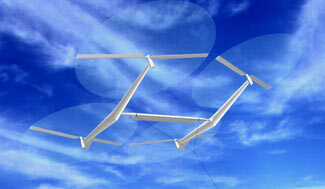 So they are trying to invent a whole new technology for harvesting wind: electricity generators that fly. One of the most ambitious ideas has been developed by Sky WindPower, a company based in San Diego and led by Dave Shepard. Mr Shepard began his career cracking Japanese military codes during the Second World War, then developed machines for reading written text. His work led to the squared-off numbers still seen on bank cards today. Mr Shepard’s flying generator looks like a cross between a kite and a helicopter. It has four rotors at the points of an H-shaped frame that is tethered to the ground by a long cable. The rotors act like the surface of a kite, providing the lift needed to keep the platform in the air. As they do so, they also turn dynamos that generate electricity. This power is transmitted to the ground through aluminium cables. Should there be a lull in the wind, the dynamos can be used in reverse as electric motors, to keep the generator airborne. Mr Shepard estimates these rigs could produce power for as little as two cents a kilowatt hour. That is cheaper than the three to five cents conventional energy generation costs. It is an attractive idea, but a flying generator is difficult thing to build—and there is a limit to how helpful existing helicopter technology will be. Aircraft require maintenance after a few days of operation, if not sooner. To operate cost-effectively, wind turbines will need to keep turning for many months without upkeep. Mr Shepard, however, thinks he has a way out. Stabilising and directing a conventional helicopter requires that the pitch of the individual blades be adjusted with every rotation—up to a thousand times a minute. That puts massive stress on the turning mechanism and wears it out rapidly. On a four-rotor arrangement, you can achieve the same effect by changing the pitch of one or two whole rotors, rather than adjusting the pitch of individual blades. Mr Shepard reckons that this will make a big difference, and will increase the periods between maintenance enough to make the project viable. Exploiting the jet stream represents the zenith (both literally and figuratively) of aerial wind-engineers’ ambitions. Ken Caldeira, a climate scientist at the Carnegie Institution who has worked with Sky WindPower, estimates that harvesting just 1% of its energy would produce enough power for the whole of civilisation. But even at lower altitudes, the winds are stronger than they are at the surface, and that has attracted the attention of other inventors. In Canada a company called Magenn Power has developed a proposal for a wind generator filled with helium. It turns around a horizontal axis, rather like a water mill, and could fly at an altitude of up to 1km. The firm sees its system as an alternative to diesel generators in remote locations where ground-level wind is insufficient for a normal windmill. Meanwhile, Wubbo Ockels of the Delft University of Technology in the Netherlands has been developing another approach to airborne wind generation at lower altitude, with backing from Royal Dutch Shell and Nederlandse Gasunie, a natural-gas company. Dr Ockels’s idea is that a kite (without rotor blades) be launched from a ground station, turning a generator as it rises to an altitude of several hundred metres. When it reaches its full height, it alters its shape to catch less wind, and can thus be reeled back in using much less power than it produced when it was being paid out. An arrangement of two or more of these kites could act together to produce a steady supply of power. When one kite was being released, part of the electricity produced would reel the other kite back in, and vice versa. The whole system would thus remain in surplus, and if well designed could deliver a constant current. This system has the advantage that it requires only simple parts—generators, kites and cables—and should thus be much cheaper to build than a conventional turbine. Controlling it, however, would be a different matter. Dr Ockels is working on kites with wings and rudders, which look much more like a plane than anything you might see flying in the park. The wings and rudders themselves would be under computer control—a technology already well established for flying aircraft without too much interference from a human pilot. To test the idea, Dr Ockels’s team is building a 100kW prototype. He hopes to start testing a full-scale device, which would generate 10MW, within five years. That would be large enough to power around 10,000 homes. He believes the system should be capable of generating electricity at a cost of just 1 cent a kilowatt hour. Any promise of such cheap energy has to be treated with scepticism, and all these projects are still a long way from the full-scale test rigs needed to prove they will succeed. No-one denies that it will be hard to build a flying generator that can make money. However, the political impetus behind renewable energy is growing and space is limited at ground level. Perhaps it is time for the wind power industry to reach for the sky.